Selling a big urban idea isn’t easy. More than ever, architects rely on jaw-dropping images to convince their clients to spend millions on their projects. And to do it, they fill their fantastical renderings with people—people who have a story all their own. These denizens of the designed future are the subject of Designing People, a show that’s up through May 19 at the Environmental Design Archives at the University of California Berkeley. From refined watercolors of the early 1900s to today’s hip urban landscapes, the architectural rendering has evolved from an elegant illustration to a high-tech marketing tool, and the people populating them have evolved as well. After arriving at Berkeley’s archives 17 years ago, co-curator Waverly Lowell found herself tucking away intriguing architectural drawings as she stumbled upon them, especially ones which incorporated an unusual aesthetic. With her fellow curator Christina Marino, she quickly realized there wasn’t much available in books about the history of the people who populated these drawings—not even an agreed-upon term, although Lowell prefers “scalie,” since the human forms were originally inserted into renderings simply to show scale. But each rendering told a story, which was largely due to its inhabitants. “We started realizing there is all kinds of information in these drawings once you start paying attention,” says Lowell . The “scalies” themselves reveal much about prevailing social norms. Many of the images in Designing People are from the midcentury modern era and it’s not just the fashion that reveals current trends. You’ll find that starkly divided gender roles are prevalent: Men are in the living room, women in the kitchen. Golfers are a running theme, especially if the project was hoping to look high-class. At one point in architectural history, renderings were as beautiful as the buildings they would become. Architects hired illustrators to take their blueprints and romanticize them. Frank Lloyd Wright’s drawings, for example, were legendary for their lush, Japanese aesthetic (which were almost all created by one woman, Marion Mahony Griffin). Slowly, these watercolors and pencil drawings began to include people, but even then, it was often in these unnaturally posed, highly stylized ways. People were added as abstract forms with the same look and feel as the building itself. Modernist project drawings, for example, might include geometric silhouettes. 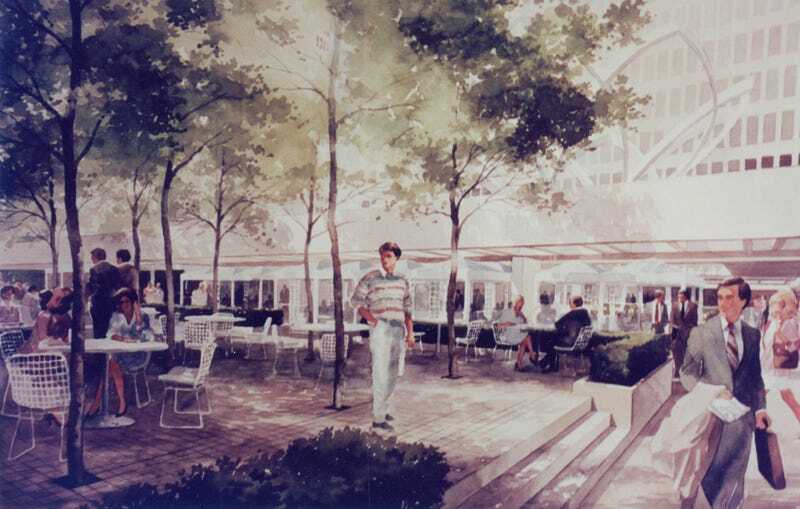 Soon, as the market demanded more than vague sketches, the only acceptable inhabitants of renderings would be photo-quality humans, with no nuance whatsoever. In the last few years, architectural renderings have undergone a strange revolution, becoming almost over-the-top parodies of themselves. Architizer has a funny series where they look at the odd choices architects make in their renderings. The Architect’s Newspaper also ran an excellent piece looking at emerging trends in renderings, from kayaks to fireworks to butterflies. Recently, San Francisco Chronicle architecture critic John King brilliantly annotated renderings for the city, pointing out their stereotypical details. Rendering for D.C.’s proposed 11th Street Bridge Park by OLIN and OMA. Note the kayak! Today, even if the plans themselves are half-baked, you’ll rarely see a hand-drawn person. People need to see people—faces, expressions, clothing, lifestyles that they immediately identify with. They need to see representations of themselves. This has led to a whole new way of snapping up the appropriate humans. So where do these people come from now? For architects, the process of collecting their “entourage” used to begin in architecture school. Scanned JPGs of people, cut out from magazines or newspapers like so many paper dolls, might be handed down from teachers to students. But the internet has changed all that. Now you can entrust a stock photography company to hire models posing as on-the-nose characters. Bundles of “Single Casual People” can be had for $50 or more. But these oh-so-perfect people are also why this kind of stock photography won’t cut it for many projects. Most of it looks too staged, its scalies far too plastic to seem like real, relatable citizens out on the streets. Architects are increasingly on the hunt for ambiguous, diverse, but ultimately believable people. Enter the industrious entrepreneurs who scour the internet for Creative Commons-licensed images of people which can be clipped out of the surrounding background. Now you can easily snap up images like “hipster leaning on wall” from sites like Easy Entourage, cleared for all rights. Then there are the entourage services which offer an almost artisanal touch. Swedish architecture student Teodor Javanaud Emdén didn’t like the quality of people he was finding on the internet for his own projects, so he started photographing friends. The result is Skalgubbar, a free website with plenty of young, well-dressed folks, often engaging in rendering-friendly activities like biking. Skalgubbar, is new—about a year old—but already it’s been featured in plenty of major projects, even ones that we’ve written about here on Gizmodo. What’s most fun about Emdén’s site is that he’s one of the few entourage providers who actually collects the examples of his people out in the wild. But this highlights another problem with certain “people” becoming popular. Already, some of Emdén’s characters have become too recognizable. Can you find “seated girl enjoying coffee in white dress” in these two renderings, one from Selgas Cano & Urban Design (top) and one from GRAFT (top)? Just looking through Skalgubbar’s archives, you really do start to see how many firms are really using the same people over and over and over. It’s kind of a shame. At one time, architectural renderings had such distinctive styles, which included the look of the people within them. Now, in their search for such a relatable, universal aesthetic, architects have managed to make their renderings all look alike.